BANGUI: The Central African Republic’s capital was rocked by deadly overnight clashes as France’s defense minister was due yesterday to formally end a military operation there, hailing it as a “success”. Local sources said about 10 people had been killed in a settling of scores between armed groups Sunday night in Bangui’s restive Muslim PK5 neighborhood. The toll had yet to be confirmed by the UN force MINUSCA-which will be alone in facing the militia terrorizing civilians now that France is ending its Sangaris operation, begun three years ago to halt mass killings in the former French colony. Residents were continuing to flee the area around PK5 yesterday, fearing further violence. A helicopter from the international force circled over the city from dawn, an AFP correspondent said. A fresh wave of bloodshed has been shaking CAR, spearheaded by rival Muslim and Christian militia groups, and many Central Africans are worried about the departure of French troops. The clashes came just after French Defence Minister Jean-Yves Le Drian arrived Sunday to close the Sangaris mission, launched at the end of 2013 to prevent a feared genocide after president Francois Bozize was ousted from power. “France will never abandon Central Africa,” Le Drian vowed in an interview with RFI radio and France 24 television as he arrived. Earlier this month Le Drian told the French parliament that the Sangaris mission, backed by a UN mandate, had been “a success”. “We stopped the mass killings… allowed a process of intercommunal reconciliation, the reconstitution of the state, a presidential election, and legislative elections,” he said. Around 350 French troops, equipped with observation drones, will remain present in CAR, around 100 of them deployed with the UN, the French government says. Two days before Le Drian’s arrival, 25 people were killed in clashes in the centre of CAR, including six police officers. The government denounced the violence as a “Machiavellian plot designed by the enemies of peace”. Le Drian was due to address parliament as well as meeting with President Faustin-Archange Touadera and officials from MINUSCA, which still has some 10,000 troops on the ground. 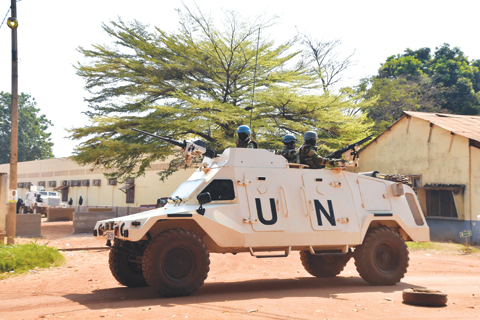 UN vice secretary general Jan Eliasson is also expected in Bangui from Tuesday for a two-day visit, MINUSCA said. One of the world’s poorest countries, CAR has scarcely emerged from the chaos of civil war which erupted in 2013 following the overthrow of Bozize, a Christian, by Muslim rebels from the Seleka coalition who installed their own leader.